It is easy to be pessimistic about Indonesia. It is an improbable nation. A gigantic, sprawling and diverse archipelagic state punctuated with multiple fault lines, chief of which are race, language and religion. Hundreds of ethnicities and identities speaking hundreds of languages and spiced up with a multitude of religious beliefs. So it is perfectly understandable that the amber lights have been flashing in the wake of the recent Jakarta gubernatorial election. It was bitter, divisive and toxic. Religion and race were at the forefront, driven by an extremist vigilante group, FPI (Islamic Defenders Front). The incumbent Basuki Tjahaja Purnama, known by his nickname Ahok, is a Chinese Christian who lost to his Muslim opponent by 58 per cent to 42 per cent. It was a worse-than-expected defeat. A district court subsequently convicted Ahok of blasphemy over comments he made about the Quran on the campaign trail and sentenced him to two years in jail. Is this a harbinger of rising religious intolerance? Will political stability in Indonesia, which has been anchored in a pluralistic and moderate Muslim polity, be upended by newly emboldened extremist forces igniting the primordial issues of race and religion? Will these unleash centrifugal forces that will tear the country apart on ethnic, religious and geographic lines? 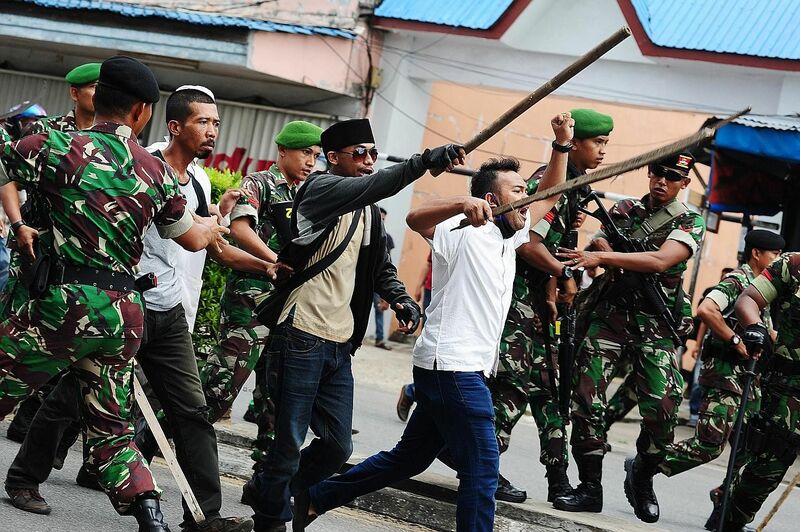 Sectarian strife is not new in Indonesia. The country has been convulsed by it as in the anti-communist conflagration of 1965 and the collapse of Suharto's New Order regime in 1998 where Chinese Indonesians were opportunistically targeted by indigenous Indonesians. In fact, in the wake of the collapse of the New Order and in the absence of any order, the country for a time descended into a free-for-all where Muslims and Christians were in open and violent conflict in places such as Maluku and in Kalimantan where Malays and Dayaks were killing each other. But despite these, the country held together. And though ethnic and religious conflicts continue to flare up from time to time - including Muslims against Muslims such as the majority Sunnis against Shias - the country continues to hold together. Why so? In a word, "nationalism". Every nation has its myth of creation. This basic identity is critical to every society's sense of origin and pride in itself. In Indonesia, as eloquently formulated by founding president Sukarno, it was that despite being different peoples, they all shared a "unity of historical experience" and are members of "one group, one nation". Together as Indonesians they rose, fought and struggled against their Dutch colonial masters to gain their freedom and independence. This powerful founding myth has created a deep sense of Indonesian identity. It is the principal glue that holds the nation together. Yes, Papua remains a challenge but in the main, there have been few large-scale regional separatist movements. And after East Timor, it is doubtful if any Indonesian leader would accept the secession of any further part of Indonesia. Even Aceh which has long fought for its independence has remained part of Indonesia, settling instead for enhanced regional autonomy. No political party, however secular, wants to risk being branded as anti-Islam in a nation where close to 90 per cent of the population are Muslims. The danger then is that in this reticence, intolerance may well take root, as hardline Islamic groups such as the FPI start to dominate the national discourse, thereby corroding the body politic. "Unity in Diversity" is the mantra of all Indonesian leaders. This is not just lip service but from the time of independence, Indonesian leaders have sought to give life to it. The predominant Javanese, who constitute 60 per cent of the population but occupy only 7 per cent of Indonesia's land mass, realised at the outset that they could not hold this diverse country together without including others in the corridors of power. Thus, Sukarno who was Javanese had as his vice-president Mohammad Hatta from Sumatra. President Joko Widodo is Javanese but Vice-President Jusuf Kalla is Buginese from South Sulawesi. His first presidential chief of staff Luhut Pandjaitan is a Protestant from Sumatra. Under Suharto, head of the armed forces Benny Moerdani was subsequently Defence and Security Minister. He was a Catholic. These are not anomalies but cut across all levels of the national government, bureaucracy and security agencies. In more recent times, political inclusiveness got a huge boost when former president Habibie announced and fast forwarded a decentralisation programme where power and resources were devolved to hundreds of local districts. Suharto's immediate successor felt that loosening the reins of government from Jakarta was the only way to deal with the threat of disintegration to Indonesia. Prior to this, under Suharto, provincial and district governments were headed by mainly Javanese officials. This caused widespread local resentments. By empowering local communities with greater say on their own affairs, decentralisation has paradoxically strengthened the ties between the centre and the periphery as elite interests had been effectively accommodated and local identities given room to flourish. Consequently, no group feels excluded in the political process as avenues of political participation have widened with elections held at the presidential, parliamentary, provincial and district levels. Indonesians get seven chances to stand for political office and vote in every five-year electoral cycle. The odds therefore of Indonesia bursting apart on ethnic and geographic grounds are low. Political Islam, however, poses a more complex challenge to the unity and stability of Indonesia. Traditionally, Indonesian Islam has been moderate and syncretic. The majority of Indonesian Muslims are characterised as "abangans", tolerant Muslims who have fused Islam with Buddhism, Hinduism and animistic beliefs. But globalisation has heightened the impact of external influences, particularly from the Middle East. A greater religiosity is now evident in Indonesia. To date, this has not manifested itself electorally as Islamic parties remain a minority in the Indonesian Parliament. National political surveys show the majority voting for a political party based on secular issues such as social welfare, anti-corruption and good governance rather than on religious ones such as adopting syariah laws. More importantly, there is a national consensus on the paramount need to safeguard the unity of Indonesia. This was the founding compact at the nation's birth - a secular instead of an Islamic state - so as to ensure the unity of Indonesia rather than risk the secession of provinces with Christian and Hindu majorities. But it would be a mistake to underestimate the influence of Islam on Indonesian politics as the recent Jakarta election showed. The fact that secular political parties such as Golkar have in recent years not just accommodated but championed Islamic agendas and shied away from criticising controversial religious issues underline this. No political party, however secular, wants to risk being branded as anti-Islam in a nation where close to 90 per cent of the population are Muslims. The danger then is that in this reticence, intolerance may well take root, as hardline Islamic groups such as the FPI start to dominate the national discourse, thereby corroding the body politic. This is not a problem which will simply go away as the trend points towards greater conservatism in the younger generation. That President Joko is not just alive to this danger but also willing to "clobber" groups that threaten Indonesia's pluralism - a word he used when saying the government would move against anyone who violates the law when exercising their constitutional rights - is what gives hope for the country's future. •The writer, a former transport minister, is now executive chairman of APS Asset Management and senior adviser to John Swire & Sons. Correction note: This article has been edited to correct the name of Golkar party. We are sorry for the error.